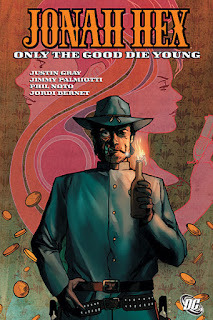 Obviously confident enough to blend fantasy concepts with one of the grittiest human heroes, the creative team behind that book which collects issues #19-24 of the Jonah Hex series, blend a really dark and ironic streak of wit with a rather sanguine view on morality and justice in one of the most enjoyable graphic novels I have ever read. I wasn't expecting to enjoy this book or the character of Jonah Hex as much as I did simply because he so different from our view of superheroes. I have never been a big fan of the whole antihero thing but this book and character really grabbed my attention and kept me really invested in the whole affair. The first three reprinted issues, Texas Money, Unfinished Business and The Currant War are all pencilled by artist Phil Noto, someone who's work I am already familiar with. There are some artists whose work I don't like but Noto's isn't one of them, I feel it really portrayed the dangerous world of cowboys really well. The first story see's Hex hire himself out to a notorious saloon boss Wiley Park for a rescue mission where he has to find his two sons but Hex becomes distracted by the Wild West's most inhospitable Brothel Madame. Don't worry, it's not what you think, it isn't long before the pair are trying to kill each other. The second story sees Hex paying for his little jest on Park's behalf in what is a little tribute to one of the iconic Conan the Barbarian scenes before reuniting with an old 'friend' to settle his score with the saloon boss. The interlude issue that separates Unfinished Business and The Current War, is Devil's Paw and is drawn by Jordi Bernet, someone's artwork I didn't really take too but that is not to say it wasn't good. The little story is full of outrage and revenge and really sets itself up as the most adult in the whole book and it demonstrates the inner righteousness that drives Hex despite his actions pointing to the contrary most of the time. The Current War really sets up the fact that one day the Wild West will be doomed and non existent in the modern world and Hex gets a glimpse at the future thanks to the inventions of Thomas Edison who hires him to take care of some stolen machines. Bernet returns to draw Who Lives and Who Dies a chilling tale that really demonstrates the atrocities the US Cavalry inflicted on the Native Americans and is possibly one of the most realistic tales I have ever seen about this time. The final story in the book is All-Hallows Eve, a superb read with a real supernatural twist and sees Hex meet up with the spirit of Justice and Hex's sometimes ally El Diablo seek his aid against Prairie Witch. Hex and cowboy Bat Lash must stop the Witch's plan to sacrifice the entire town of Coffin Creek. This story was the most surprising story of all which feels like a teen horror flick but that feel is strangely suited to Hex! This book is dark, bloody and funny and the really sly blend of humour and social commentary makes it one to pick up for older readers and those with more of an open mind to genre blending. And do you know, I really, really enjoyed this book! JONAH HEX: ONLY THE GOOD DIE YOUNG, WRITTEN BY JUSTIN GRAY AND JIMMY PALMIOTTI WITH ART WORK FROM PHIL NOTO AND JORDI BERNET WAS RELEASED BY DC COMICS IN 2008.